On October 20th, 2012, thousands of people from all over the area gathered at the Mabee Center to celebrate 4 decades of Christian music. The evening marked the 40th anniversary of the Mabee Center and 35 years of broadcasting for KXOJ. 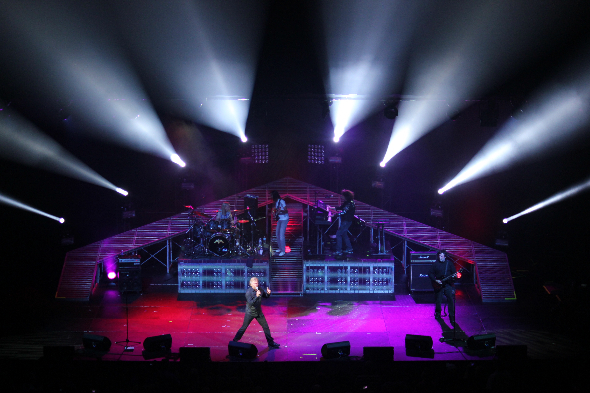 Special guests included Audio Adrenaline, 4Him’s Andy Chrisman, Avalon, Jaci Velasquez, Clay Crosse, Wayne Watson and the original 80’s lineup of Petra, complete with their touring stage from the 1985 Beat The System Tour (the last time the stage would ever be used by the band). The evening consisted of music, memories and fun videos between acts from heritage KXOJ sponsors as well as other artists who could not be with us. This page contains some of the highlights for your enjoyment. Photo below begin with the Meet & Greet and are followed by performance photos, all courtesy of Mabee Center.